My optimism got allot higher with the recent Bodie, Komarov, and Santorelli signings. But now trying to guess what the possible line-ups could be, I really can't say. That's a good thing, as perhaps there isn't a huge drop in talent as there has been in the past? I think JVR Bozak Kessel will continue to be a lock for 1st line. Didn't Frattin show some chemistry with Kadri in the past? Do the two Finns, Komarov and Kontiola, play together? I think Holland showed some great promise. Kadri might be the weakest of all the centers on face-offs. Someone has to play the wing. What to do with David Clarkson? I'd swallow my pride and let him have Orr's position on the 4th line. 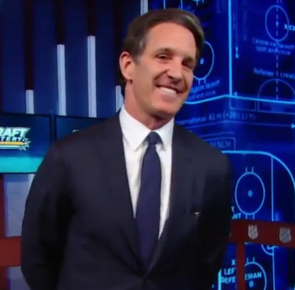 Perhaps Shanahan can have a positive influence on how to build a line that would utilize Clarkson better? As for the defence, have to wait and see if there's any movements. Looks like a 70-20-5-5 goal % spread to me. As usual if the 1st line isn't producing we don't win. Still, I think running 4 lines is the way to go in today's NHL. put holland in the 3rd line center spot over that euro guy that hasn't established himself at the nhl yet. I initially had the 3rd and 4th lines switched. But can't see Clarkson's contract going on the 'fourth' line. I do see the two Finns together for some reason. If Mike Santorelli is the second line centre, Leafs finish bottom five. If David Clarkson is the second line right-wing, Leafs finish bottom five. Frattin will be with Kadri. and i'm betting Holland don't go below third line. Of all of those guys I'm guessing it's Clarkson that the team will be most eager to give every opportunity to advance. I wouldn't be at all surprised if he has a good camp that he then would get back into the top 6. First line is a given. I still think that the way Clarkson's season started last year with the suspension really put him behind the 8-ball. I think that this season he'll be much better. Having him with Kadri and Lupul (or JVR) will open up space for Kadri to create chances. I'm not the biggest fan of Kadri's but he's a good passer so as long as Lupul and Clarkson can finish, that line can be successful. If I recall correctly, Clarkson wasn't given that much of a chance on a scoring line but rather used mostly in a 3rd/4th line checking role for most of they year. Third line has the 2 Finns together to help get Kontiola's feet wet again in the NHL. I'm not worried about Komarov fitting in as he has already shown he's an NHL'er. For Kontiola, having a familiar face on your wing should help him fit in. Santorelli can be used as a winger too if I recall correctly. Fourth line will be able to check with Bodie or Ashton on one wing and the work horse Frattin on the other. Holland showed last year that he has some offensive skill so this line isn't so much a time eater but could really turn into somewhat of a threat to pot a few goals. The D-lines are all over the place at this point. Right now, I think it's pretty safe to say that Phaneuf, Rielly, Polak and Robidas are locks. Gardiner is a lock assuming he's not traded or holds out and the 6th spot is wide open it seems. I like Franson but he seems destined to be traded away which I think is going to be a mistake given that the most we'll get for him straight up is a 2nd or 3rd pick or middling prospect. I would love to see Franson on that top pair but as listed above I don't think he'll be around much longer. I see Franson as a third liner with lots of PP time. He shouldn't be near the top line. Unfortunately, I agree with you. The team can take away Carlyle's assistant coaches, and the team can take away his preferred style of play (explain the reason they are keeping him again? ), but they have to leave him with something and that has to be lineup decisions. Carlyle has a love-affair with these garbage type players and he's not going to just give up on that, especially for guys like Ashton/Holland/Bodie when he wasn't doing it before. The 1st line stays together because it is productive. It's defensively challenged at times but there really isn't anyone else on the team who makes it better defensively without taking a massive hit offensively. I like the idea of trying to see if Frattin can regain his form with Kadri. It's another questionable defensive line but it has some decent speed and Frattin gives the line a chance to get to pucks quickly if carrying the puck into the offensive zone isn't available. The 3rd line is about puck cycling. As much as Clarkson was useless last year, I think he might work a bit better with a line that can try and hold the puck in the offensive zone and Holland is the best suited center to do that with. Komarov works well along the boards to complement it. The 4th line isn't a traditional 4th line by any means but it has the potential to chip in points and really when you look at the roster, I don't think there should be a huge difference in ice-time between the 3rd and 4th lines this year, at least until certain players establish themselves as more or less reliable. What I really like about this currently lineup is that it will likely have anywhere from 3-6 million in cap space available heading in to the season. This isn't a lineup that should not be contending for anything more than 3rd place or the two wild-card spots at best. Save cap space so that if the Leafs are falling way out of contention they have the space to eat contracts in return with contenders to improve draft pick return if the trade guys like Reimer, Lupul, Franson down the stretch. Since we don't know and are just guessing, I will do the same - I could envision it being a situation where Shanahan came in and, after they met with Carlyle and the decision about the assistants were made, Shanahan (and Nonis) told Carlyle that the game is changing, the 4th line has to be able to play, etc and to basically not play Orr/McLaren. Of course, the easier way to do that would be for the GM to step up and demote them. But I swear I read/heard an interview with Nonis or someone this summer stating that the 4th line has to be able to play, and it struck me as different than what I'd heard in the past. But maybe I'm just remembering wrong.